In the last blog, I highlighted some practical strategies to help you optimise your nutrition when life is hectic. Over the next few blogs I want to dive a little more into some of the science behind each meal of the day, and highlight some things you can think about as you make food choices through the day. So, you wake up. Get ready. How many of you eat breakfast? I am going to try and convince you why eating breakfast can be important if you need to maintain focus and concentration from the start to end of your day, as well as training volume and intensity! Most cells in our body want to use glucose as their primary source of energy. In particular the brain. So, our bodies try to maintain our blood sugar levels within a narrow range that means a constant supply of glucose can be provided to all the cells of the body. When we are in this range, we have sustained energy and we can do work. If our blood sugar gets lower than this range, we are fatigued, we can’t concentrate, we are hungry. Energy is low. You may not always consciously register this. Particularly if you are in the habit of running on empty. In the morning, when we haven’t eaten since the evening before, our body has to work to maintain blood sugar levels. Our body is breaking down the glycogen and fat (and muscles, if we are really in energy deficit) to keep the blood sugar up. So, if you need to be mentally alert and focussed, you might want to take this stress off your body (particularly if it is already fighting fatigue, a cold, work induced stress, injury etc) and eat! Okay, so assuming I have convinced you (if you were skeptical) that breakfast is the bomb, what should you eat? In terms of sustained energy, not all foods are created equal!! The main rule: avoid foods that are essentially all sugar. Why? Sugar is sugar. It does not need to be digested, it is already small enough to pass straight through our gut and into the blood and around the body. So it moves rapidly into the blood. 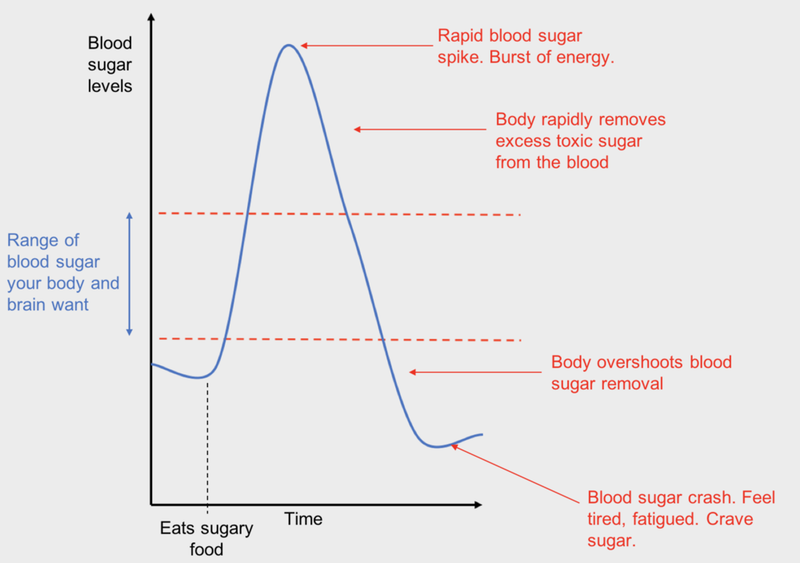 Blood sugar levels spike – high and fast. Yep, this will give you an energy surge. But the body keeps blood sugar within a range because high blood sugar is dangerous. So the body reacts quickly and aggressively to strip the excess sugar from the blood. In its haste, we overshoot. Blood sugar levels crash below the ideal range. You feel an energy crash … you get hungry quickly, and moreover crave the food that will quickly raise blood sugar and increase your energy. i.e. more sugar. You're on a blood sugar roller coaster, and it's hard to get off it. So – choose foods that also contains a mix of starchy carbohydrates, proteins and fats, with fibre. This gives you a steady release of blood sugar over time … giving you sustained energy across the morning. Common challenges – you don’t have time, or you don’t like eating first thing. A coffee with full fat milk plus a banana will do. Or a handful of nuts with berries. Takes two minutes. And you can eat them on the go (although preferably sitting down for the benefit of digestion … a topic for another time! ).